DAVID4 is a very low-cost system for contact-free scanning of 3d objects. The only hardware requirements are a simple commercial hand-held laser and a standard camera. With reasonable hardware, the scan accuracy is around 0.1% of the object size. 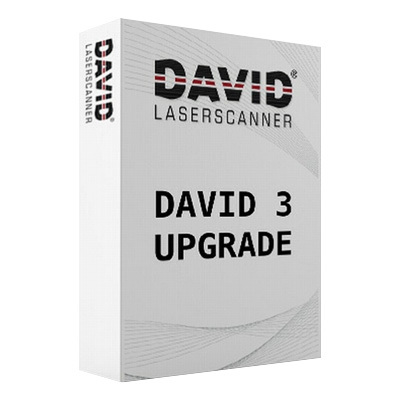 The user interface of DAVID4 is easy to use and the scanning process is very simple. Just take a lightweight laser module and sweep the laser line over the object. The flexible illumination direction prevents laser shadow problems and allows you to scan surface parts that remain inaccessible by other scanners. You can scan the objects from all sides, even from the top and the bottom. DAVID is the first and only software that supports both, “classic” Laser Scanning AND Structured Light Scanning! Structured Light (SL) makes scanning faster and easier. 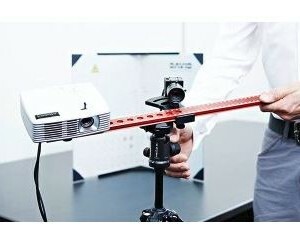 For this method you can use a standard video projector instead of the line laser. You can use nearly every MS-Windows compatible camera with DirectShow / WDM support, like your web-cam or fire-wire camera. You can even use your camcorder if you can connect it to your PC (and if you have suitable DirectShow / WDM drivers). The scan setup is very scalable. You can simply scale the whole setup up or down to scan small or big object sizes – from coins to cars! In combination with a laptop you get a very stable and mobile scan solution. 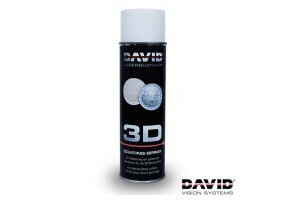 Inspect your 3d model right after scanning with DAVID’s integrated OpenGL-based 3D viewer. You can select and delete surface parts easily with your mouse. With our fully integrated tool called “Shape Fusion” you can align and merge multiple scans that were made from different viewing directions. A precise alignment of your scans is very easy. Just choose one of several registration modes and a few seconds and mouse clicks later, you get the aligned result. You can fuse/merge the aligned scans with a single mouse click. The result is a connected regular triangle mesh. Our fusion method is more than just an ordinary mesh stitching, since it calculates the average of overlapping surface parts, reduces noise and outliers and optionally fills all remaining holes. You can define the mesh resolution and smoothness value to optimize the fusion result for your intended application. You can grab camera shots that will be used as texture. In all alignment and fusion steps, textures are processed along with the 3d data. The result is a fused triangle mesh with a fused texture. DAVID4 exports texture coordinates, which allows you to import the textured object in third-party software. All data (e.g. scans, textures, transformations, …) can be quickly saved to and loaded from single project files. DAVID4 supports the Alias Wavefront OBJ file format, the stereolithography STL file format and the Polygon File Format PLY, wich are well-established formats for triangle meshes and are supported by many other 3d applications. Since DAVID4 is a pure software solution that does not rely on specific hardware, you can save money and re-use your own hardware (especially your camera or video projector) for other things. With DAVID4 you can compare scans to a 3D reference model. Variances are color coded in 3D or given as signed distance values for user selected surface points. Simply need metric distance between point pairs on scans? No problem. DAVID4 supports a simple C plugin interface for turntables. 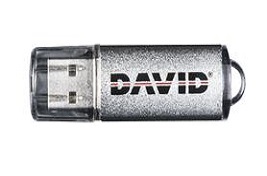 This allows to integrate own turntables into DAVID4. DAVID4 can be controlled by your own application using the DAVID SDK.